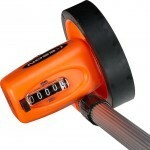 PRODUCT DESCRIPTION: This handy measuring wheel can be used to measure curved, horizontal, and asymmetrical surfaces. Weighing less than 2 lbs., the 3-section handle telescopes up to 38” for measuring without bending and it telescopes down to 17” to fit into a toolbox or standard briefcase. Wheel Circumference: 1 ft. Measures up to 9,999 feet, 11 inches without resetting plus it adds while rolling forward and subtracts when pulled in reverse.